NOTES: Short run injected plastic kit. Mach 2 kits have taken a lot of flack from posters on this and other sites. They are rough. They are expensive. They are made in France. The first condition we expect from short run kits. The second we are learning to expect from all kits. Together the two are a bit more than most modelers are willing to shell out for. The third is simply a bit of chauvinistic Francophobic fallout from the two countries political differences. However – If you are keen on subjects overlooked by even the Czech molders, and willing to get down and dirty into the Bondo and sandpaper, then Mach 2 has some interesting offerings. Anyone wanting detailed history can go Googling; there’s more than enough. I’ll just include the required paragraph. The advent of intercontinental nukes sort of negated the advantage of far flung, full blown air bases. One measly missile and your air defenses is out of business. Planes that could be deployed randomly to unimproved areas seemed the way for the Air Force to go. The Navy, too, wanted fleet air cover without lugging around an aircraft carrier. VTOL, Vertical Take-off and Landing was the answer. “Vectored Thrust” (aim-able exhaust) technology hadn’t yet been developed; (the jet engine itself was barely out of diapers); so the scenario called for airplanes that would sit on their tails, pull themselves straight up with more-than-one thrust to weight ratio, transition to horizontal flight to do their thing, then shift into reverse for recovery. Simple to envisage, hard to realize in real aluminum. Problem One: Supine hovering and backing into a parking space aren’t in most pilots’ portfolio. That’s been solved by computer controls and engines that can blow down while the plane points horizontal; as in Harrier. Bigger Bugaboo: Engineering and construction compromises mandated by the complex design take a big bite out of the plane’s performance. No sense fielding a fighter that can go anywhere only to get whomped by the bad guy. 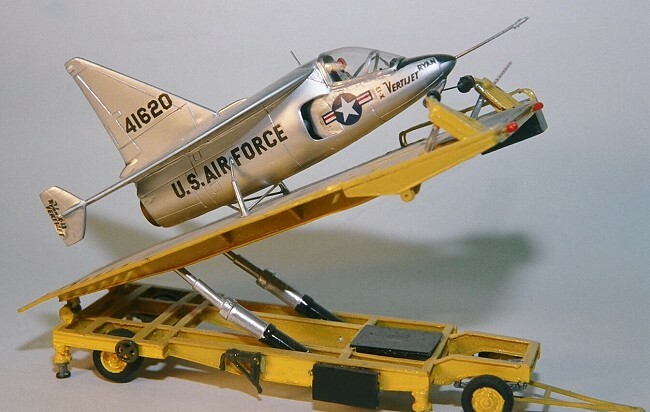 Those problems, and the lack of $$$, by the end of the 50’s, put an end to VTOL fiddlings. 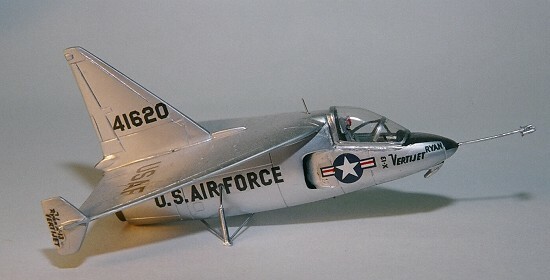 The experiments, though, produced some interesting aircraft, now available in 172 scale. Convair’s XFV-1 Pogo (KP), Lockheed’s XFV-1 (first Merlin, now recently Valom), and Ryan’s X-13 Vertijet (Mach 2). 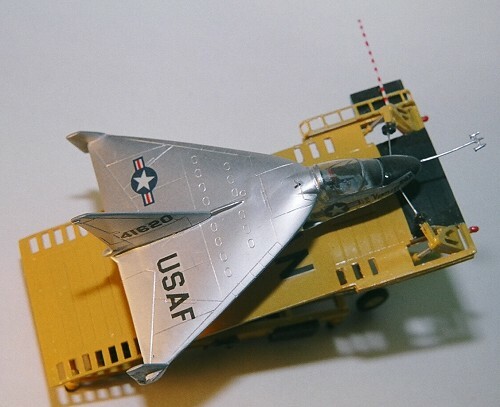 Editor's Notes: Anigrand does a slew of VTOL prototypes in resin for 1/72 scale. Secondly, both X-13s are extant. One is in the USAF Museum and the San Diego Aerospace Museum has the other. Nowhere near as bad as the Internet whiners scream. Waxy plastic, flash, sprue gates the size of water mains – sure; but, as noted, that comes with the short run territory. Fit wasn’t bad at all; just minimal filler needed. Vac-anopy clearer than most and fit without need for fussing or cussing. Posters on another review site claimed the delta wing panels were unequal widths; but digital micrometer readings revealed a perfectly isosceles triangle. Only scratch building needed on the plane was the pitot probe and the itsy-bitsy-teeney-weeny vanes and venturi thingies on its end. The launch trailer was another matter. This was actually the bulk of the kit. The telescoping elevation pistons came in halves that wouldn’t fit together at all, but these were neatly replaced with lengths of plastic and aluminum tube that slid perfectly inside one another. Could have even made the elevation thing operable if desired. 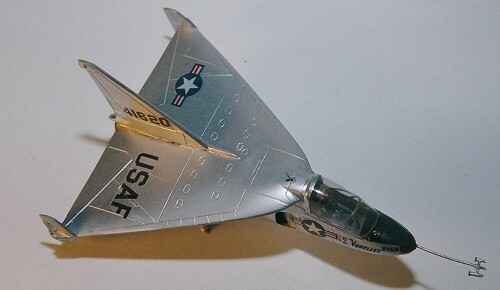 In 1/72 you can get away with monochrome metal, which I did with Model Master silver. Prior attempts at “panelizing” had ended up as masking tape disasters; but our editor’s recent 3-tone XFV-1 was the inspiration to spring for a coupl’a $7 bottles of Alclad II. Will try the stuff next NMF occasion . Kit decals by Propagteam are excellent all around except in their unforgivingness. Once they touch plastic they refuse to budge. Secret to sliding them around is a drop of liquid soap in the soaking water. Trailer was sprayed with Model Master chrome yellow and hand brushed black details. Don’t believe the bad stuff you hear about Mach 2 kits (‘cept the part ‘bout them being expensive). They require little more than the usual shot of short-run plastic surgery, but build up into decent replicas of out-of-the-way airplanes.